Alcatra is the Queen of churrasco barbecuing. Our Brazilian BBQ Blog Alcatra: Queen of the churrasco. Alcatra: Queen of the churrasco. So your appetite may be wet to learn more about churrasco, since it is still a little cloaked in mystique. I’m going to try to pull the curtain back on many of the details of it and make it far more approachable as time goes on. Let’s continue this journey along the path of churrasco in the cow, specifically in the sirloin. It’s the central prime cut from which most churrasco originates. It’s delicious, juicy and economical. You’ll see it coming to your plate plenty of times during the many rounds typical in a churrascaria. Let’s continue this journey along the path of churrasco in the cow, specifically in the sirloin. It’s the central prime cut from which most churrasco originates. It’s delicious, juicy and economical. You’ll see it coming to your plate plenty of times during the many rounds typical in a churrascaria. Alcatra is a large and long cut of the top of the sirloin. The sirloin is the prime cut below the tenderloin, or filet mignon. ‘Sur-loin’ in French. or under the loin. It’s a long muscle, ranging between two and three feet, and serves as a back muscle for the cow. It has a small thin fat cap, and stretches out as one long cut or roast. Typically in America, you’ll see it sliced against the grain as large steaks. And within those steaks, you can see what appear to be smaller divisions. Or mini steaks on closer inspection. This is because the sirloin has three elements: the top, bottom, and tip. 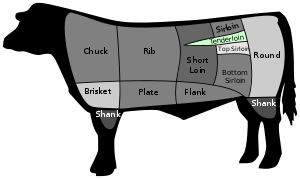 In a typical sirloin steak, you’ll see elements of the top and bottom separated by connective tissue, or gristle. Then they typically cut the tip into cubes. Which is a massive waste of good beef, since you can use them in Brazilian style as a picanha as mentioned in our previous post. The Alcatra occupies a position of prominence in churrasco, second only to the king of Picanha. In past times, when churrasco evolved from the plains of Brazil and Argentina, gauchos would butcher a cow in the field into its prime cuts. The selling off the good cuts to local aristocrats. They saved the less expensive cuts for their own consumption, and from that, they reserved the sirloin. The Alcatra is a great piece of meat. It’s big and long and occupies almost the entire length of a large skewer. Preparation is easy. Firstly, take an alcatra and run a large skewer through it from top to bottom. Then, salt generously and place it on the fire. The alcatra is also host to a special treat at times. Gauchos will make small knife pricks in the meat and insert whole cloves of garlic. By doing this, they are making what they call “garlic beef” as they bring it to the table. It’s a simple trick. Firstly, take a paring knife and stab it into the meat about two inches. And then push a whole garlic clove into the slit with your thumb. As it cooks, it just gets more and more delicious. As a result, you look better and better to your guests. So, there you have the story of Alcatra, the queen of the pampas.